Although New York’s Citi Bikes grabbed most of the bike share spotlight in 2013, Chicago’s Divvy bike share system racked up some pretty significant numbers during its first year. The city released a flood of data earlier in February, and cyclists in Chicago are pouring over it to see what kind of patterns are emerging. Chicago Streetsblog is doing a great job dissecting the statistics. One of them is pretty significant. Women hold 31 percent of annual Divvy memberships, but only took 21 percent of trips last year. Nationally, women make up about 43 percent of bike share users. What’s keeping Chicago women from getting on Divvy bikes? Meanwhile, the numbers show that annual members make up 47 percent of Divvy trips, with non-members taking the majority of trips. Last year, During the 187 days of service in 2013, users made 759,788 trips. 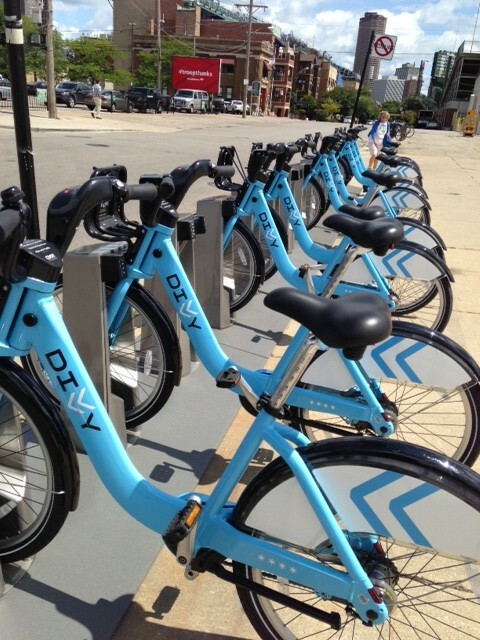 But, Divvy members tend to ride bikes longer when they check them out. The average trip for non-members was just over 30 minutes. But the average trip for a member was just 12 minutes. That might be because members have a better feel for where Divvy docks are located, and can figure out where to pick up and drop a bike. Chicago Streetsblog has some information about a great Divvy contest for people who love to hack. The company is asking for entries in five categories — infographics, maps, images, animations, or websites — that help illustrate usage patterns. Entries are due March 11. According to Streetsblog, the winning entries in the five categories will be displayed at 1871, a tech startup center at Chicago’s Merchandise Mart. Think you want to compete? First, review the data challenge rules and get acquainted with the data on the Bike Sharing Data website. Then, start your data wheels.